For this project, I decided to write about my 4th great-grandparents, Samuel and Eliza Drake of Killyleagh, County Down, Northern Ireland. It turned mammoth, so I’ve split it into three parts. I long ago determined that these are the parents of Eliza Jane Halse (my 3rd great-grandmother), but all the evidence was circumstantial: Eliza J. Halse crossed the ocean with Samuel and Eliza Drake in 1850; she lived with them in Smithfield, Rhode Island, in the 1850 census; she moved with Samuel (Eliza presumably having died) to Iowa about 1857; she took responsibility for Samuel at the end of his life, as a dutiful daughter would. But the Drake family has posed more questions than answers in my research. When and where did Eliza Drake die and where was she buried? What was her maiden name? Who were all the other Drakes living with Samuel and Eliza in 1850? Were they children or could they be nieces and nephews? When did Samuel die and where was he buried? I decided to revisit my research on this couple and the younger generation and see if I’d missed some vital clue. Indeed, I had. And it turned out to answer most of those questions and help me “reunite” the Drake family. Complicating my Drake research was the fact that these people never gave consistent ages. They varied radically. When Samuel and Eliza Drake arrived in New York City in May 1850, they gave their ages as 40.1 A few months later, they reported their ages as 58 and 56, respectively, probably closer to true.2 The younger generation was just as bad. When Samuel and Eliza immigrated, only two of their children were married, Eliza J. Halse and Mary Ann Murphy. The Murphy family immigrated separately the same year.3 Apparently, the other Drakes also immigrated separately and they all gathered in Smithfield. The Drake household in Smithfield, Rhode Island, in August 1850. In 1850, there were 16 people in the Drake/Halse household, a few of them apparently unrelated (the Fitzsimmons family and Hugh Young). The additional Drakes included: Samuel, Richard (who immigrated with Samuel and Eliza), Martha (“Matha”), Thomas, and William. They could all be children of the older couple, based on their ages.2 Were they? 1856 Iowa census record with Samuel Drake, William Murphy, son and nephew. Because there are two Samuel Drakes, I will refer to them as Sr. and Jr., though they did not use those terms. It appears that the land patents belonged to Samuel, Jr. Eventually, Robert Halse, William Murphy, and William and Richard Drake (as partners) ended up with some portions of these properties. A descendant of William Drake, Earl Drake (he who rescued the Dexter Cemetery in South Dakota), did quite a bit of research on the Drake-Halse-Murphy families. It’s difficult to determine if there’s any truth to this. The fact he was in Rhode Island in August 1850 and the mention of silver mining make it suspect. No one was looking for anything other than gold in California in 1849. 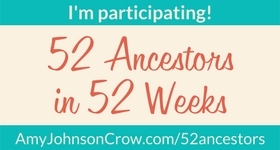 In 2012, I visited the Winneshiek County courthouse to find family records, but not being experienced then, I relied on the local genealogical society to tell me what records I should ask for. I missed some by not doing my own research. Now those records are available on Family Search, but only by going to a Family History Center (FHC). Our local FHC is only open on Tuesdays from 11 – 2. Sometimes I can con talk the docent into opening at other times, which she graciously did for me on Wednesday. I wanted to look through the probate and land records to see if I could learn more about Samuel Drake, Sr. The probate index had a record for Samuel Drake – but when I looked at it, it was probated in early 1860, and I knew Samuel, Sr. was still alive in 1862. Samuel Drake, Jr. wrote out a will on a single sheet of paper on December 28, 1858. He stated that he was 41 years old. Two unrelated people signed as witnesses.6 It seems a bit odd for a single, childless man that age to be writing a will. He must have been in poor health and known he had not long to live – possibly ill with tuberculosis. William and Richard were both single and apparently adventurous. Where were they in 1858? California or Nevada? Silver mining was more likely around then, so it’s plausible. Samuel, Jr. was dead just thirteen months later. William did return to Iowa to claim the land, but Richard never did. Perhaps he smelled the winds of war coming and he headed to Canada, never to return. One of the perks of life back then was a person’s ability to make up an age. Any age. I would have been thirty five in perpetuity. 😂 Well they deserved some kind of perks, right? They didn’t even have toilet paper! Yes, at the very least they deserved that. In lieu of spa day, or toilet paper . . . fudging their ages seems a decent consolation prize. I enjoyed your post, it’s also directing me to narrow some of my “projects” and writing on my blog after our whole week trip to Cornwall (ending today) plus the wider stuff on English history. I’ve absorbed so much contextual information in a couple of months …. time to start really digging now! I’ve enjoyed the brief posts about your trip and look forward to the in-depth pieces! I’m leaving on a research trip tomorrow for a couple weeks. Good luck. I didn’t find much specific family information about individuals but visiting where they lived and worked has been very very interesting. I wonder if they gave a younger age upon entry into the country because they were worried they wouldn’t be permitted if considered too old?? I didn’t know that silver mining was a lucrative job. I have a great uncle who went west to work in the Arizona silver mines, never to return home again. Must have beat farming! I can’t imagine the appeal of mining work except that it pays better than the alternatives. Wow! 🙂 $200 was a fortune back in 1849! It was all spent on gambling and women?! If saved, it could have been used for mansions and huge land purchases! Indeed! There were some who wisely did just that. One cousin of mine bought oceanfront near Big Sur. What a strange stipulation to put in a will! I wonder why 15 months? My grandmother (my namesake) rarely signed her name the same way twice. Apparently she didn’t like it much so kept playing with the spelling, and without a birth certificate (that I’m aware of) no one is sure which one is right! I expect the 15 months May have been an estimate a doctor gave him for how much time he had left. It is an odd thing, because he would have had to tell people he’d put it in the will, something that is usually not revealed until you’re dead. Great post! I love it when I read wills that aren’t entirely boilerplate phrases and terminology! A little postmortem manipulation is always interesting to discover! Yes! I agree. Most wills are pretty straightforward, but not this one. It’s always fun to find a will – even a standard one.